The first day was sweltering with temperatures reaching 80 F even at elevations of 5000 feet. We waited by the Beckler River to stay cool riverside 6:00 pm when we hiked in to Blanca Lake in the cooler, but still nearly molten evening. 7/28 The next morning there was no dew to compete with and we had tents packed and were off to have breakfast on the lake shore in no time. After a gorgeous lake shore breakfast we forded the stream which instead of the normal mind numbing cold, was actually nearly 50 degrees and not bad. We navigated around the lake to camp on the north shore of Blanca Lake. The most interesting aspect was the dozens of trout in the 8-14 inch range swimming just below the surface and visible even from some distance, hmmm. The camp was unusually quiet, where were all the marmot whistles? We did not see one in our two days at this normally busy marmot community. An hour or so later we left camp to begin work on Columbia Glacier. To reach it of course we had to commute through the tunnels under the snowfields. The glacier itself, had a slightly above average amount of blue ice exposed. In general snowpack was lower in the center and eastern side of the glacier than usual and a bit deeper on the western avalanche prone side. The warmth generated considerable melt, and the glacial surface streams draining into moulins were gushing. We measured 17 cm of snowmelt in a 24 hour period. We had a 12 foot long probe which we took turns using to ascertain snow depth. 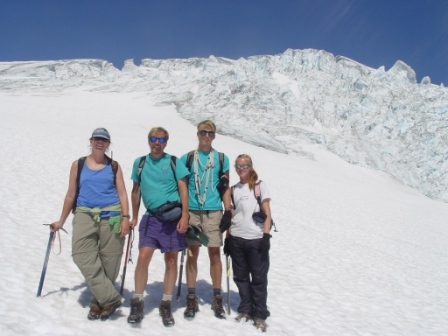 7/29 The next day was the all-time record heat day in Seattle, but we spent most of the day with long sleeves and gloves on as we mapped the glacier and continued to probe snow depth. The mapping is accomplished using GPS, inclinometer and laser ranger to ascertain glacier surface elevation between fixed points at the bottom and top of the glacier. The only warm part of the day was the self arrest practice at the head of the glacier and the ascent to Monte Cristo Pass. The ascent is a mixed bag of loose talus, bedrock scrambles, a snow tunnel and a short snow slope crossing. In the late afternoon as we left the glacier a thunderstorm began to inch over the peaks. Lots of lightning but little rain was produced. 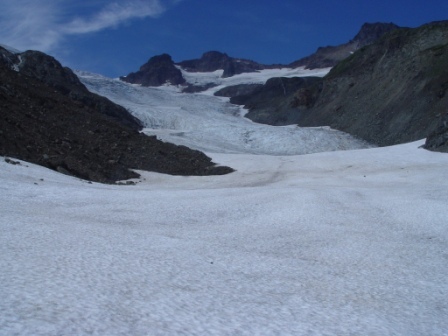 The preliminary mass balance value for Columbia Glacier is -0.7 meters. 7/30 The next morning we got up around sunrise packed and headed out before it was too hot. This worked perfectly for the three hour morning backpack. We waited until 6:30 to set off up the trail due to the heat again to reach Easton Glacier. We were joined by Cory Cleveland from U of Montana, who wanted to assess soil microorganisms in the new soils exposed by glacier retreat. The heat gave extra energy to the flies and the normally pleasant hike through the meadows was anything but. The glacier outlet stream was a raging torrent due to the heat, there was little time to contemplate as the flies were probably the worst I have ever experienced. They usually subside at 65 degrees and that usually occurs in the evening, which is why we set out then. The crossing on two water slickened 8 inch diameter logs was accomplished with only one of our feet slipping into the torrent. The slog up to the Scott Paul trail jct. was mercifully over 45 minutes later and turning the corner at the moraine, the Easton Glacier came into view, a breeze chased away the heat and the bugs and all was well. The evening hike to camp at the end of the glacier was beautiful albeit tiring as this was our second backpack of the day. At camp the down glacier breeze was cool, and we quickly had to put on jackets and hats as dinner was prepared. 7/31 A gorgeous day overall, although like all of the previous days, haziness limited distant views. The snowline on Easton Glacier was quite high at 6400 feet for the end of July. We first mapped the lower section of the glacier including the terminus, which had retreated 15 m from the previous summer. The terminus has a gentler slope and fewer crevasses than any other year since 1990. Snowpack assessment on the bench at 6400-6600 feet indicated snow depths averaging just over 1 meter, when 2.25 m is more typical and last year there was 2.75 m. A reexamination of this area on 8/16 indicated another 1.2 m of melt with most of the bench now blue ice. We surveyed a number of surface streams as we descended the glacier, the heat led to a number of swampy areas and streams that were overflowing there channels. This normally marmot rich area, finally yielded our first spotting for the year. The marmot was grazing on Saxifrage Tolmeii. 8/1 A gorgeous day again, we spent the first five hours ascending to 8500 feet on the east side of the glacier measuring snowpack depth by probing and more frequently in crevasses. The soft snow prompted extra care in probing for hidden crevasses and the snowbridges and while fun was tiring. The snow depth was far below average until 7200-7500 feet where a quick rise from just over 2 m to 4 m occurred. This indicates the snowline during a couple of winter rain events. The descent through the icefalls on the west side of the glacier required more care than usual. The descent to the terminus at 5600 feet featured numerous stream measurements and assessment of melting from ablation stakes. Ablation over the past two days had averaged 14 cm, compared to a typical 8 cm. 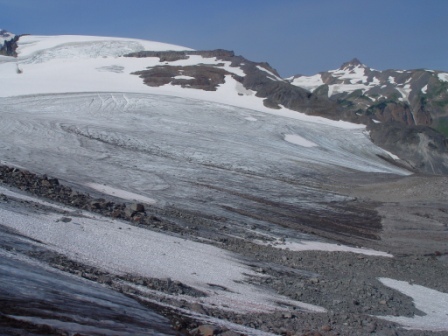 The preliminary mass balance value for Easton Glacier is -1.4 meters. 8/2 We packed up and headed out early this time succeeding in getting to the trailhead before the flies stirred. A swim in the unusually mild Baker Lake, which must have been 75 degrees at least, was welcome. At the west end of Table Mt. the view to Ptarmigan Ridge indicated minimal remaining snowpack. In fact the steep snowpatch on the descent from the Chain Lakes JCT to reach the actual ridge was gone for only the second time in the last 26 years, this is the steepest exposed snow slope we cross with backpacks all summer, so this was not unwelcome. The ascent to Ptarmigan Ridge proper put us into the shade of the ridge for the rest of the hike. We spotted our first mountain goat all alone shortly after this. The hike was pure delight after our two previous hot buggy, backpacks into glacier base camps. We reached Camp Kiser as the sun was just about to set. From the ridge beyond Coleman Pinnacle and just above camp, we spied 46 goats below the small Ptarmigan Ridge glaciers. Jill and Shannon had never seen such herds, and as wildlife enthusiasts, were awestruck. 8/3 Sholes Glacier was the target on this day. Before leaving camp we checked out the goat herd which had moved to right below the north buttress of Coleman Pinnacle. Thirty minutes later we rounded the corner onto the Sholes Glacier and observed the extent of the blue ice, the most I have ever seen on this glacier at the start of August. Crampons were put on and we traversed the upper section of the glacier measuring snow depth as we progressed in the narrow 100 meter ribbon of snow covered area beneath the steep drop-off from the ridge leading to the Portals. The whole route provided a view of the terminus area and a herd of 62 mountain goats. They viewed us with little alarm from a distance of 300 m at our closest approach. 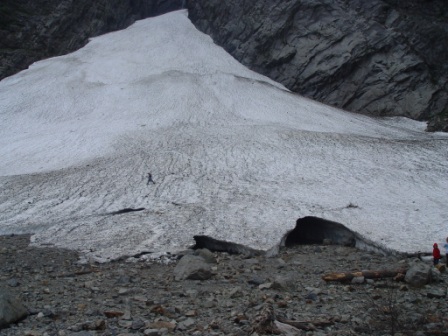 The region between the Portals at the head of the Sholes Glacier was all snow covered by 2-3 m of snow-pack , much less than average. We descended from the Portals to the terminus for lunch, finally forcing the goats to move from their well used dust patches. One group had been right near the terminus, and left us a horde of horse flies for entertainment during lunch. As on Easton Glacier the surface streams were gushing providing ample opportunity for measurements after lunch. Shannon surveyed the lower margin of the glacier, to determine retreat. While we finished probing and measured supraglacial stream velocities. Sholes Glacier had more ice exposed than any other year except 2005 and about the same as 1992. The preliminary mass balance value for Sholes Glacier is -2.5 meters. That evening we completed ice worm counts on Sholes and Ptarmigan Glacier the maximum was 80 per square meter on Sholes Glacier and 75 per square meter on Ptarmigan Ridge Glacier. 8/4 The next day was the only day we split up, Shannon and Jill explored the outer Ptarmigan Ridge and Camp Kiser area identifying all rodent dens, goat beds etc. They started out by surveying the ridges nearby to our camp then backtracking onto the trail from which numerous marmot holes can be found. They descended into Camp Kiser, spying the pack of 46 goats we had previously seen, which retreated further from the trail upon their passing. They then continued by surveying along and behind the surrounding ridges, finding evidence of goats everywhere but limited evidence of marmots, and next-to no evidence of other small animals. They used GPS to record the locations of their finds throughout the day. Ben and I headed for Rainbow Glacier. To reach the glacier you have to traverse the Sholes Glacier, we saw the 62 goat herd again, to the Portals then descend across Portals to the Rainbow. 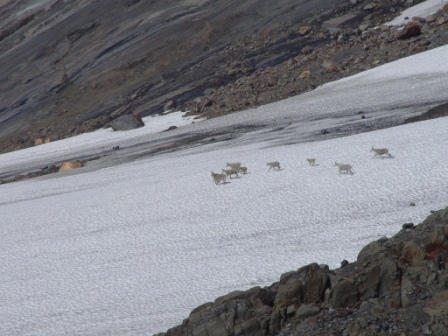 We saw a herd of 10 goats, clearly separate from the other two at the edge of Rainbow Glacier. The snowline was quite high at 5500 feet on Rainbow Glacier. Measurements in the upper crevassed area of the glacier peaked at 4 m, compared to the usual 6 m. The down glacier wind is always strong and cold on this glacier. Our main companions this day was a group of Rosy Finches, that followed us most of the day. The river canyons on Rainbow Glacier were impressive as usual, there were two locations where we could dump dye into a moulin and observe the water return to the glacier surface some distance down glacier. It flows much slower through the glacier than on top of the glacier in the surface streams. An interesting aspect is that immature streams tend to be straight and of even slope and fast. There is a strong correlation between April 1 snowpack water content (SWE) and the eventual annual mass balance of North Cascade glaciers. In fact 65% of the variability is predicted by April 1 SWE at five long terms sites with reliable records. The snowpack SNOTEL sites that best represent North Cascade snowpack are the Stevens Pass, Rainy Pass, Miners Ridge, Lyman Lake, and Fish Lake. The winter has been unusual from the start with November and early December being dry and mild, leading to minimal snowpacks less than 30% of average, 3.2 inches at Stevens Point. From Dec. 15 until Jan 10 precipitation was amazing, temperatures quite cool and snowpack reached near average at the mountain stations, 19.4 inches at Stevens Pass, that is more than 0.5 inches per day on average for the interval. This period ended with a warm rain event. From Jan 10-March 1, an unusual pattern of dry conditions prevailed with snowpack remaining unchanged, but declining in comparison to the average mid-winter development, Stevens Pass increasing only to 21.8 inches. By the end of the period snowpack was close to 50% of average. March was a wet and cool month, which drove snowpack back to near 100% for the mountains overall, 31.8 inches at Stevens Pass, but less than 100% at the higher elevation North Cascade stations that are a better indicator for glacier snowpack. The average snowpack at the five SNOTEL stations since 1946 is 1.11 m swe, this year on April 1 it is 0.91 m swe. This is a La Nina year and a year with cool ocean temperatures offshore of the Pacific Northwest, a negative PDO. This is the only recipe that consistently yields positive glacier mass balances, in 15 of the 17 years these conditions have occurred since 1960 South Cascade Glacier has had a positive mass balance. Given that La Nina is predicted to end this spring it is unlikely that summer temperatures will be low enough to preserve the limited snowpack. In addition we are likely near the end of a prolonged wet-cool period that began around March 1. A La Nina continuing through spring typically promotes cool but not wet weather. The longer range forecasts are suggesting a warm last half of April. Given these factors it seems unlikely that snowpack will increase significantly reach the long term average at the five sites. It if further unlikely that summer temperature will be well below average with end of La Nina. My model says positive mass balance, on the ground data values suggest negative glacier mass balance for the 2009 season. The summer melt season has been extraordinary with average melt rates in July the highest we have recorded in 26 years. 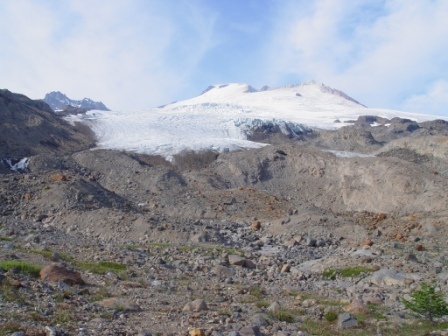 This has led to substantial negative mass balances, volume losses for North Cascade glaciers in 2009. As they mature they develop meanders and plunge pools, both of which slow down flow. Most maturing systems enhance efficiency, not reduce efficiency. The terminus was buried by a huge avalanche, now all we had to do was ascend 3000 feet back to our camp. The preliminary mass balance value for Rainbow Glacier is -1.7 meters. 8/5 The morning hike to Artists Point was gorgeous, marmots, pikas and goats all provided us with sufficient reason to not notice the toil. Conditions were also cool even at the trailhead. We descended to Austin Pass for the hike to Lake Ann and the Lower Curtis Glacier. The stream crossings in the valley below Austin Pass were either dry or a trickle, only 2005 featured low water like that. Snowpack on the last slopes to Lake Ann did not impinge on the trail, which is also unusual. 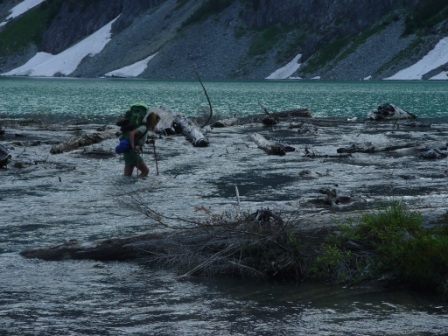 We camped beyond Lake Ann just before the stream crossing where the climbers trail begins the ascent to Shuksan proper. A gorgeous late afternoon and evening, and we had Lake Ann all to ourselves. Low clouds began to form in the Baker Lake valley, suggesting a bit of marine incursion for the next day. 8/6 We awoke to fog than blue sky, than fog, as we were right at the upper limit of the marine layer. This made for some pretty lighting conditions. The hike to the glacier was slowed by blueberry picking. We first checked the terminus position. Ben collecting a water sample from the stream issuing from the glacier cave at the terminus. The terminus had retreated 11 m from last year. And with no snow at the terminus is poised to retreat rapidly in the next two months. Snowpack on the glacier was quite low. We probed the snow depth at 90 locations and found the average depth to be just above 2 m, compared to 3 m for an average year and 3.5 m last year. One goat clung to the buttress on the east side of the glacier, what a precarious place with little food to be had, we decided it was hiding out from the heat and bugs for the day. Surveying the glacier was slowed by going into and out of the cloud, fog impedes use of the laser ranger. We finally finished our profile which will indicate changes in glacier surface altitude across the center of the glacier. Additional berry picking on the descent was made comfortable by the cool cloudy conditions, the fog was clearly not going to burn off. A chorus of pikas greeted us as we moved around camp, from the talus slope above. The preliminary mass balance value for Columbia Glacier is -1.4 meters. 8/7 A wet pack up in the morning, just wet fog still, had us on the trail shortly after 7. A very peaceful hike out to Austin Pass. We hiked into Big Four that afternoon. We preceded to measure the area and volume of the main avalanche cone at Big Four. The volume I have not calculated but the area was, 0.07 square kilometers, maximum snow-ice thickness was 115 feet. The volume will be calculated after additional fall measurements. We also determined the slope and edge of the snowpack, so that David head and Tom Hammond can revisit the site in the fall and determine the amount of melt that had ensued. From Big Four we headed to the Cle Elum River valley and the Cathedral Rock trailhead. 8/8 We headed up the trail at 7 and had a cool and very nice bug free hike in to Peggys Pond area where the howling wind prevented any mosquito attacks. After lunch it was off to the Ice Worm Glacier. The glacier was upside down with respect to snow. Lots of snow at the terminus and all blue ice at the top of the glacier. 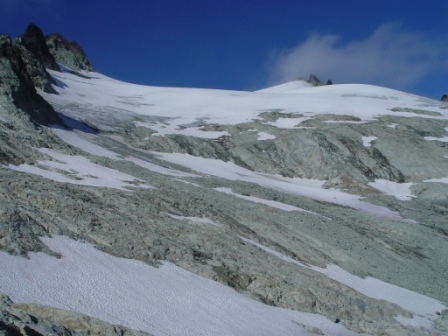 The lower section was buried by some large avalanche deposits and will remain snow covered to the end of the summer. The upper section on the ridge used as the primary summit route to Daniels is thin and melting. 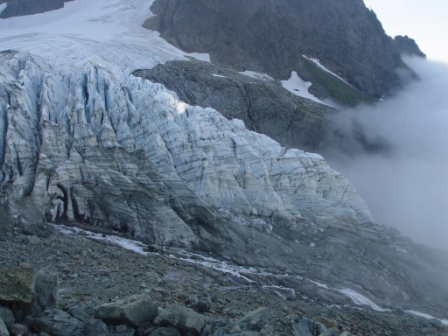 This glacier continues to melt faster at the top retreating, 20 meters since 2007, than at the bottom. The wind remained quite strong on the glacier, I wonder how windy it was on top of Daniels, have to check the trail reports. As the sun went behind the ridge at 6:30 the wind chill dropped to its lowest point of the field season, all clothes were donned as we were again enshrouded by cloud. In the middle of the night a strong hour long wind storm was followed by a cessation of strong winds. 8/9 At 7 we were enroute to Daniels Glacier. The terminus is a 1.5 mile ridge ascent and traverse from the Peggys Pond area. The glacier had a fairly normal amount of blue ice showing. From the terminus we made an ascending traverse up the 35 degree slope of the Daniels measuring snowpack as we went. The snowpack was quite thin indicating that lots of blue ice will soon be showing. 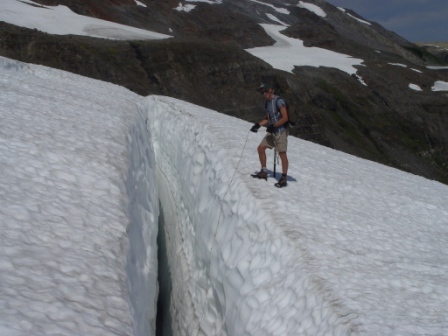 Daniels and Lynch have numerous crevasses that are overhung, lacking vertical walls and can be relatively hidden. This kept us probing for them carefully. We crossed onto the Lynch Glacier experiencing little wind at the divide, but entering the cloud on the west side. The next several hours were spent traversing the glacier to its western edge than descending to the terminus, then ascending all the way to the corniced top of the glacier skirting the mammoth bergshrund and emerging between the middle and main peak, the summit of Daniels was ours five minutes later. Snow depth on the upper Lynch was 2 m instead of 3.5 m. Views from the summit were limited by cloud, and we soon began to descend from the middle peak down the 37 degree upper slopes of Daniels. Standing glissade conditions were excellent, glissade 50 m stop and measure snow and repeat. Snowpack on the upper Daniels seldom exceeded 2 m and never exceeded 3.5 m. Our descent was interrupted by traversing across the glacier to below the east Peak and then back to out line of descent, probing all the way. Then was our chance for even more glissading to the terminus. The marmot population had been below normal at all our field sites until this one, plenty of marmots greeted us every time we left camp. The preliminary mass balance value for ice Wrom Glacier is -1.1 meters, for Daniels Glacier -1.3 m and for Lynch Glacier -1.3m. 8/10 Hiked out just before 8, saw two mule deer close to the trail head and one on the road back. We stopped at the Cle Elum River and Ben and I had a quick swim. We then headed out to visit Bill and Barb Prater at their house for lunch. Around 3 we said our goodbyes and started making our way to the airport. 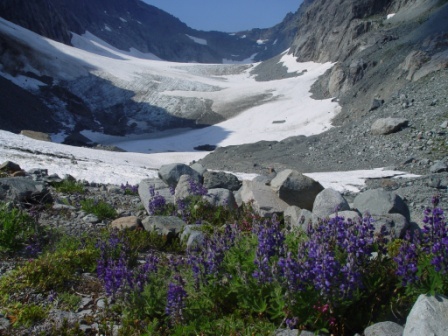 North Cascade glaciers have lost a significant volume this summer due to the exceptional summer melt conditions. Copyright © 2019 Mauri Pelto. All rights reserved.